It’s a heroic name boosted by a pop star. 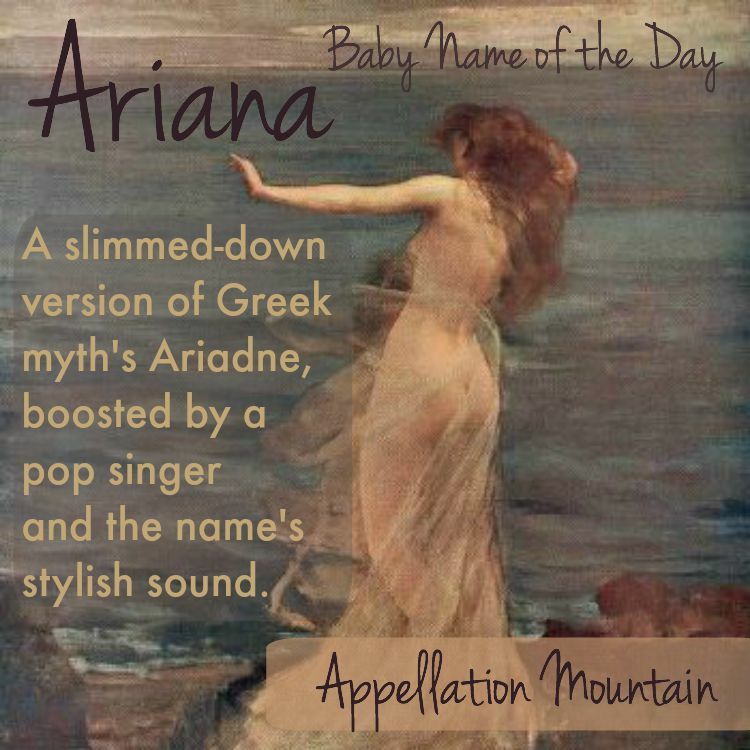 Thanks to Brittany and Virginia for suggesting Ariana as our Baby Name of the Day. Up until the late 1970s and early 1980s, this name was quite rare in the US. Television series Logan’s Run used Ariana for a character in 1978. Veteran soap opera actress Ariana Chase got her start in the 1970s. The one ‘n’ spelling was used for a Rockefeller daughter in 1982. 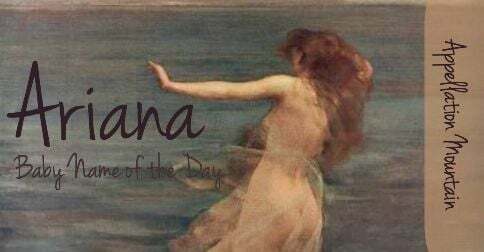 Arianna is originally the Italian form of Ariadne, meaning “most holy” from the Greek elements ari – most – and adnos – holy. In Greek myth, Ariadne is quite clever. It’s Ariadne who helps Theseus defeat the Minotaur. The couple ran away together, but there was no happily ever after. 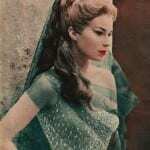 Accounts vary, but we know that Ariadne was abandoned on an island, and eventually married the god Dionysus instead. Some tellings make her a goddess, while others leave her a mortal princess. In French and German, the name is Ariane. The Slavic languages tend to preserve the ‘d’ with Ariadna. I suspect that the single ‘n’ spelling of Ariana is thanks to Spanish speakers. I’ve also read that Arianna caught on in Italy in the 1970s and 80s. While there are definitely women with the name born in those decades, I couldn’t find statistics to back that up. What’s certain is that both spellings have caught on steadily in the US. As of 2014, Arianna ranked #40, with Ariana at #37. That represents a slight reversal. Arianna had been more popular until 2014. 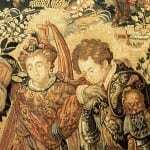 The story of Ariadne has been a popular one, depicted in paintings and sculpture, retold in poetry. Richard Straus and Anton Chekhov are among the many to re-tell her story since. It’s not just the high arts that have embraced the character – Inception featured an Ariadne played by Ellen Page, and the character appears in various pop culture uses over the years, including the BBC’s Atlantis. Huffington Post founder Ariana Huffington was born Ariadne-Anna in Greece. Cheri Oteri’s cheerleader character on Saturday Night Live wore the name. Mary Hoffman’s Stravaganza young adult fiction series uses the name for a duchess in her alternate, Italian Renaissance-ish world. Albus Dumbledore, of Harry Potter fame, has a sister by the name. Princess Ariane of the Netherlands is third in line to the throne. But it’s Nickelodeon actress-turned-pop superstar Ariana Grande who probably comes to mind. It’s said that her name was inspired by Princess Oriana, from the Felix the Cat comics. After a string of hits in the last few years, Ms. Grande probably gets at least some credit for the rise of the single ‘n’ spelling. But it’s not just about the pop singer. Ariana has found favor with Spanish-speaking families. It’s a great English-Spanish crossover name. It’s also wildly on trend. Fast-rising Aria, as well as Ariel, Arielle, and Ariella are also Ari- names that are going places, and the similar Adriana/Adrianna had a good run in recent years. All together, Ariana is an on-trend name boosted by pop culture, but with plenty of substance, too. What do you think of Ariana? Do you prefer Ariana, Arianna or Ariadne? Ariana is just a bit too frilly for me – Ariane is so much lovelier. And I don’t particularly like this Ariana Grande person so there’s that.